I’ve been really slacking on this blog stuff. But with the holidays squarely behind us, I’m slowly getting back on track. Which leads me to two important announcements: I’ve had two stories published since I last posted. The first is in the December 2011 issue of Fantastique Unfettered. It’s called “The Bachorum Principle,” and was born out of anger. I can honestly say it’s the most disturbing story I’ve ever written. 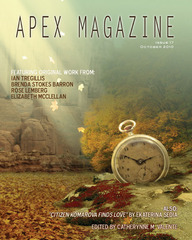 The second appears in the January 2012 issue of Bards and Sages Quarterly. I wrote “Little Brother” in 2010. I don’t remember what inspired it, other than wanting to write a horror story from a little boy’s point of view. The new year is off to a decent start with two new short stories drafted and a third in progress. How are you progressing toward your goals so far this year? I realize this is late for a year-in-review post, but this is really more for my own amusement and record than anything else. Self-indulgent? Maybe. But here it goes anyway. As a part of 2011, I joined the W1S1 effort. That is, I strived to write and submit a story each week. Though I started in June, I kept on track for quite a bit. I eventually dropped back to the monthly version of the challenge because I was trying to finish the draft of my novel. Still, I kept up with that version as well. I don’t like making new year’s resolutions, but I feel confident this year is going to be a good one for writing. Though it’s somewhat out of my control, I’d like to make several more sales this year, including to pro markets. I’d like to be able to join the SFWA by the end of the year. Nothing’s guaranteed, but I know I won’t get anywhere unless I write. And write. And write some more. And once I’m done, I need to submit. And submit. And submit some more. Here’s to a prosperous 2012 everyone!